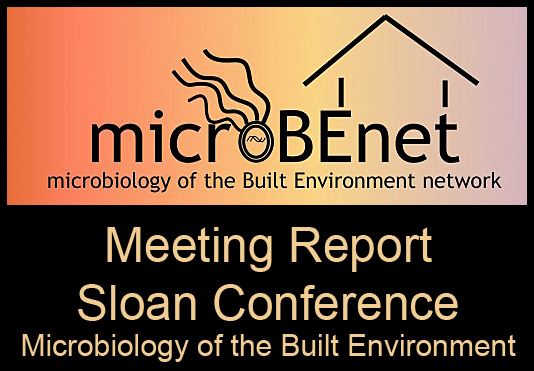 This meeting is an annual gathering to bring together all of the Sloan grantees, their labs, and other stakeholders in the field to discuss the status of the microbiology of the built environment program. Thanks again to Mark Hernandez and Alina Handorean for all their hard work in putting it together. Note that I will update this post with video links to many of the presentations and hopefully to the slides on Slideshare as well. We kicked off the talks with “Making Research Relevant for the Building Practitioners’ Sphere” by Elliott Horner from Underwriters Laboratories, one of three talks by practitioners in the built environment (i.e. government or industry). It was really nice to hear his perspective on regulatory and legal issues in the field. This was followed by a talk by Jack Gilbert and Brent Stephens about the Hospital Microbiome project which seems off to a great start. Then Bubba Brooks (Banfield Lab) talked about their study of the influence of the neonate environment as a source of microbes found in infant guts. They had some good evidence that in fact bacteria are being transferred from surfaces in the NICU to infants. Followed by Eric Franzosa from Curtis Huttenhower’s lab who talked about the relationship of urban public transportation systems and the human microbiome. Then Denina (Nina) Hospodsky talked about work in her new lab (Lars Angenent) on the upstate weatherization project. The afternoon kicked off with the second building practitioners talk by Peter McKinney from Strion Air “Impacts of Energing Large-scale HVAC Filtration Technology” which provided a detailed overview of different kinds of air filtration technology. Then Scott Kelley gave a talk about viruses in the indoor environment, basically highlighting the fact that they are both really important and really hard to study. Jordan Peccia gave a talk entitled with only keywords “Asthma, fungi, moisture, diversity, and dogs” which talked about the hygeine hypothesis and fungal diversity. Norm Pace gave a talk called “Who’s in the Water You Drink? Microbiology of Municipal Water Distribution Systems” which served the usual function of reminding us how impure our drinking water is. Last up was Noah Fierer “Building a predictive understanding of bacterial and fungal diversity in homes”. Noah talked about the “dog effect” and about their various ongoing house studies in collaboration with the Wildlife of Our Homes project. The session opened with “The Business and Science of Reclaiming Buildings from Water Damage: Current Gaps in Research and Practice” by John Lovett from Droplet Measurement Technologies. He talked about the commercial application end of this field and encouraged people to form corporate partnerships. Next up was Holly Bik who is part of our microBEnet team. She gave a talk called “Social Media for Researchers” which was a very nice overview of how social media can help scientists, a discussion of varies platforms, and details on how to tweet. Slides here. Her PLOS Biology paper on the topic here. She was followed by Rob Knight who gave an update on the MoBEDAC project including some of the cool new functions they’ve been working on in QIIME and VAMPS. He also showed an awesome video of visualizing a time series of microbiome data in 3D PCA space. Greg Caporaso then gave a talk called “Built Environment Surface Successions” about their new project looking at microbial community deposition over time. He also talked a bit about spiking 16S sequencing runs with a standard (known) community in order to normalize run-run variation which is an idea I’d love to hear more about. Amy Pruden gave a really interesting talk about her work called “What in the World is Premise Plumbing? Facts and Fiction on What Lives and Corrodes in Our Drinking Water Systems”. She showed some really interesting data on Legionella growth in different kinds of pipes and at different temperatures. James Scott finished out the morning with “Unraveling the Whiskey Fungus Story” which reminded us all of the importance of doing traditional microbiology in parallel with our culture-independent studies. Here’s a good Wired article about the story. The afternoon started with a joint presentation by folks from the Puerto Rico Consortium, “Built Environment has Different Meanings for Developing Communities”. They talked mostly about building science measurements from various rural structures in Peru (very different when say there are no walls), as well as the logistical difficulty of keeping samples frozen in the jungle, many miles from any electricity. Jessica Green and Charlie Brown from the BioBE Center gave a joint presentation “Measuring Inputs and Outputs Through a Growing Multidisciplinary Collaboratory Success”. They showed some of their usual cool visualizations of building microbiome data, as well as talking about the challenges of rewards of working in such a cross-disciplinary manner. Then Tom Bruns gave a talk about the work being done as part of the BIMERC Consortium. They’ve done a lot of cool fungal work in the built environment and his main take-home message was about the danger of only looking at diversity and not an absolute measure of abundance such as biomass. A sample could appear to be low diversity simply because there is a huge amount of a few taxa so you don’t sequence to the depth to see all the less common taxa. “The Microbial Landscapes Within Wineries and Dairies” by Nick Bokulich from David Mills group at UC Davis. 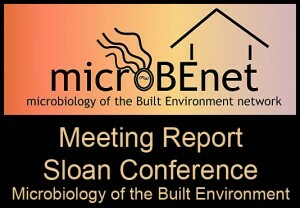 Lastly, our very own Jonathan Eisen talked about the past, present, and future of microBEnet. We need more work on the fungi, the viruses, and probably the archaea (which no one even mentioned). Looking only at bacterial 16S isn’t probably giving us enough of the total picture. This meeting talked a lot more about issues with DNA-based surveys in terms of not knowing if the things we find are dead or alive. Or if they’re actually growing and thriving on a surface or they’ve just be passively deposited there and are hanging out waiting for something (e.g. water).